The two big swaps I'm in are ongoing -- they each run about 3 months. 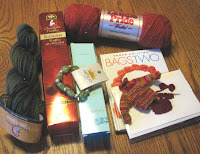 Packages in the mail filled with yarn goodies arriving all summer... what could be better? This is the package of goodies I received last night when I arrived home after a day on the road. I got it in my head that I wanted to find one or two nice wine shops north of Ann Arbor (Livingston & western Oakland counties, primarily) to carry our wines. We have lots of customers from Brighton, Howell... those areas, who have been repeatedly asking for a source of our wine near home. I visited 5 shops (several tasted all the wines I brought with me), got 4 orders, and two more who were very interested but not ready to write an order on the spot. Got home at close to 9 pm. Whew! Anyway, back to the package. It was waiting for me when I got home. What a wonderful package of goodies! Lamb's Pride worsted in a lovely rusty red-orange, Misti Alpaca (baby alpaca... yum!) in a gorgeous variegated green colorway, a smoothing skin scrub, an adorable notecard with cute little knitting on it, a tiny knitted sweater in beautiful colors (did my partner make that herself? ), and truffles made with ice wine! Ok, I'm going to be good and wait until Holly (my sister, the winemaker) comes home -- she's out of town right now -- to share my truffles. But it's gonna be difficult! Thanks partner. Everything is perfect! Edited to include two more treats. Out of sight, out of mind, eh? The Vogue-on-the-Go Bags II book -- great bags in there, I was reading it last night -- and a cute little bracelet too. Thanks again!